Well, I'm a slacker + didn't post a 5 month update - but Happy 6 Months to my buddy! I swear, life gets more + more fun as Jack grows + grows. We did a fun little family outing for Jack's 6 month + took him to his first Baseball Game + then to get some ice cream at Big Spoon Creamery. Don't worry - Jack only got like the smallest tiniest bit of raspberry sorbet. He loved it though! The past few months have seriously been so much fun! Jack just keeps growing in personality + is the funnest person to be around. I love every second I get to spend with him - even if they're seconds of crying or teething or whatever. Jack is now sitting up on his own, pulling to standing + standing (while holding onto something). He says mamamama + babababa. We're still working on the "dada" sound. Jack started sleeping through the night literally on his 5 month birthday + we haven't looked back since (thank you, Jesus.) He is an early riser though + generally sleeps from about 7 - 6, though lately here he is blessing me with a 5:45 AM Wake Up Call. Naps are still total crap, but whatever - the boy likes to party! He loves to cuddle with his lovey, rests his mouth on you to give you kisses, lays his head on your head or shoulder to give you cuddles - he's a cuddler + it's the best thing that ever happened. He loves to smile + to laugh + loves when Dad gets home from work. He loves to dance to LMFAO + the Moana soundtrack. He still loves jumping + also really loves to flap his hands. We graduated to no baby bath at all + he thinks that is the coolest thing that ever happened. He literally loves people + loves the days when we are busy + he gets to be around everyone we know. I am absolutely loving being a mama. Like any really sweet, good thing in life - it has it's moments, but God has really been teaching me patience + compassion + understanding. 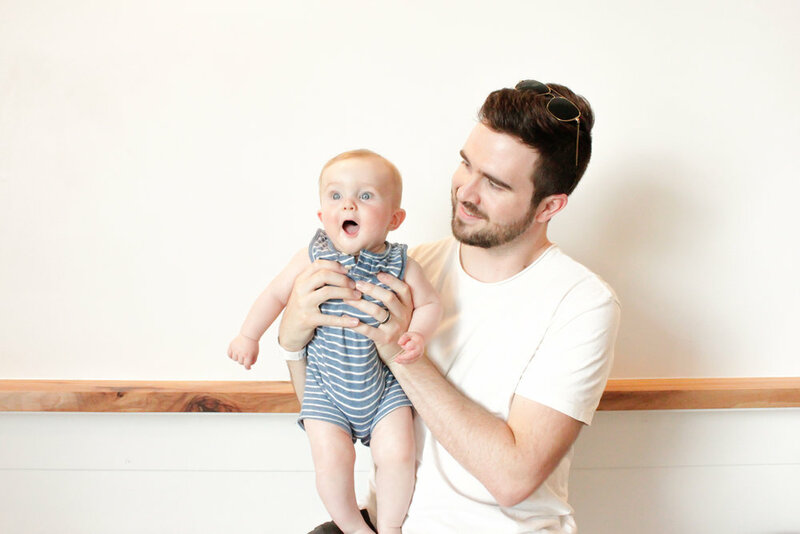 I'm learning to find just as much joy in the days filled with teething tears + tired arms as I do in the days filled with squeals of delight + dances around the kitchen. I'm lucky to be the one that can be comfort and peace and safety to Jack. Just like I'm lucky to be the one that can get laughs all day from dancing around with a burp cloth on my head. Happy 6 months, sweet baby boy! I love being your mama so very much.